Check out our little dude!! I woke up this AM to an absolutely fantastic surprise!! A traveling family was able to visit Shepherd’s orphanage and not only see him and hug him, but they got some pictures for us!! 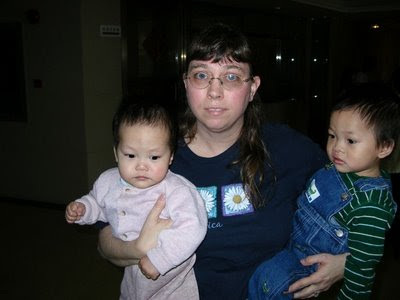 I am just beside myself because there have been several families who have traveled to adopt their kiddos from his CWI recently, but who had decided not to go to the orphanage. So when Wendy agreed to take our little guy a small gift, I tried not to get my hopes us as I know families have to take into consideration their child’s needs when deciding to visit or not visit their child’s orphanage. All that to say, “Holy Cow!! I AM SO EXCITED! !” Is he not the cutest? His little feet remind me so much of Jude’s before we had his feet corrected… I just want to love that little man UP!! Okay, I’ll admit, I’m biased, but he is STILL the cutest 🙂 Wendy’s new son Steven is pretty darn adorable, too! Thank you, Wendy, I am SO grateful!! What a wonderful pick me up for you! One of my friends is supposed to be bringing Maggie a care package on Monday and then we will see her in 2 weeks…wahooo! Oh, what a special gift! How nice of Wendy. He is just sooooooo cute!!! What a wonderful gift, he is so darling, cant wait to follow your journey to China, this will be my 3rd. one with you haha. Love that myadoptionwebsite.com. Wishing you a speeding TA. You are a wonderful person. Before you know it he’ll be running along side Jude! SO DARN CUTE!!! Congrats on the pics!!! He’s looking so healthy!!! Oh my goodness, oh my goodness, what a fabulous treat for an otherwise gloomy day. He is just precious!! Oh, how I remember the joys of waking up to an email with my little sweethearts face looking back at me. Your little dude is indeed a very handsome little man! It is so great that families can network like this to help each other out. What a gift to get more pictures of your beautiful little guy! I think his feet and his little toes look great. Can’t wait for the little booger to come home. How awesome for you!! He’s just a little doll too! HE looks like a big boy! How great to see him, what a sweet lady to send those to you! What a precious little guy, and what a gift the pictures are! I am soooooooo happy for you! He is absolutely adorable!!! What a great friend to get you the pictures. I can just imagine how wonderful it would have been to get pics of EllaKate! God is so good!!! Oh my goodness he is so precious!! What a wonderful friend Wendy is to have traveled to the SWI and take pictures for you : ) I hope you hear something very soon….can’t wait to follow your journey! What a wonderful gift! He is so adorable. We’ll pray that you’ll be lovin’ on him very soon! Wow Stef what an AWESOME gift- could he be any cuter??! Wow Stef, what a gift! Could he be any cuter?! You’re right. He is a cutie. New pictures!!! What a beautiful gift. He is just the cutest! Nothing biased about it, he is CUTE!!!!! What a blessing to have these photos! I am so happy for you! I hope you have a wonderful weekend! Awwww how cool is that!!! He is def your cutie! LOVE him!!! He is soooo CUTE!! What a blessing to have received these photos!! Hopefully it won’t be long until we see photos of YOU holding that precious baby boy! Oh my goodness, what a miracle! Stefanie – he is soooooo cute! Can’t wait to see your arms around that sweet boy! God bless WENDY!!!!! That is so amazing & he is looking healthy & gorgeous!! Let’s get him already!!!!!! He is a handsome boy, only more handsome will he be, in your arms. I cannot wait to see!! What a perfect thing to wake up to!! He is so cute! How wonderful to see these pictures! What a special gift. If you’d like to share even more about yourself ( I know everyone can’t get enough;-) consider yourself tagged. You know the drill…..list 7 random things about yourself on your blog, place a link back to me in the post, and then tag 7 more friends ( or however many you would like). WOW!!!!!!!!!!!!! I know you are just dying to get your hands on that sweet little man!!!! I cannot believe she got to hold him, I am peeing my pants I am so excited for you! that is CRAZY COOL!!!!!!!!!!!! Thanks for sharing the smile! Oh I know that did your heart good. I have been a lurker on your site for sometime. You have such a precious heart and I am so happy your received this blessing. What a wonderful gift to get these pictures. Sheperd is so adorable!! I am so happy you are having the chance to see Shepherd grow and develop through these pictures while you wait. Tooooo cute for words! What a wonderful surprise. But then, all your kiddos are beautiful! Congrats on adding one more! What a cutie! and what a gift you got!